Even as a notional concept the global coverage has varied greatly over time, being less than 50% of the Earth’s surface for about one-third of the data record from 1850 to 2015 and only having been greater than 75% for only the last 60 years (since 1956). Even at the end of 2015 there was no coverage of 16.6% (i.e. 1/6th) of the Earth’s surface. As a measure of global temperature, then, Hadcrut4 is only valuable for the last 60 years or so, at best. There is no reasonable explanation of why earlier data should need a greater adjustment because temperature observations should have the least interference and distortion when the station commences operation at any given site. In other words, the adjustments are supposed to take into account problems that develop after the station is operational, such as heat-trapping buildings being constructed near the station. Thus, adjustments should affect the recent data more than the past data, but this audit found the opposite. The problem, of course, is that only the adjusted data are used by climate scientists trying to understand global climate. So climate scientists are using data that overemphasize any warming that has happened over the past 150 years. The author does more than simply list his many (justified) criticisms of the Hadcrut4 data set. In Section 8.7 of his thesis, he proposes a method to construct the best possible data set for global temperatures. I am not sure I am qualified to assess the value of his proposal, but based on what he has found in his audit, something must be done. I don’t understand the third problem. Aren’t adjustments always made after a station becomes operational? Regardless of how old those stations are? How does this differentiate between older and newer data? Yes, they are made after the station is operational. But the idea is the early years should be the closest to ideal, since the station is new and the spot has been chosen as a good one for measuring temperature. Thus, the raw data should be the closest to the real value when the station is newer. Consider, for example, the urban heat island effect, caused by the fact that roads and buildings heat up their surroundings. Stations are initially built away from civilization to reduce that effect. As time goes on, however, civilization approaches the stations. That makes the stations read hotter. If any systematic adjustments should be made, then, the later years should be cooled, not the early years. I was in a conversation about this a few years ago trying to explain this in general against someone who was adamant that the data has been consistently measured for a long time. This article gives me a reference for the future. Thanks! I don’t see much in the way of new science or better ways of assessing uncertainty — same old, same old. Projections are based on the CMIP5 simulations. There are some more recent references cited in the ‘impacts’ chapter. 2) Are there any benefits to the increased greenhouse gases that might at least partially offset the amount they hurt? Since we don’t know the answer to (1), it is hard to answer this question. I am a big fan of using renewable energy where it is practical, and I am a strong supporter of investing in research and development that will make renewable energy more practical in more situations. However, until we can get reasonable answers to the two questions listed above, it is scientifically irresponsible to make sweeping policy changes that we know will have severe negative impacts. Dr. Wile, what do you think about this Guardian article, which argues that climate models actually are accurate? Not sure who else to ask. Gridcell extreme frequencies in CMIP5 models do not overlap with observations. And satellite-measured temperature trends in the lower troposphere run below the CMIP5 rates in the same way that the HadCRUT4 surface data do, including in the tropics. The model-observational discrepancy is real, and needs to be taken into account especially when using models for policy guidance. You’re the best Dr Wile! Is satellite data used from 1979 on? If not, why not, since it’s supposedly more accurate and complete? Thanks. Unfortunately, satellite data are rarely used. The rationale is that you shouldn’t mix methodologies in data collection. I think a lot of this was mentioned in the book Climategate by Brian Sussman. He talked about how spotty the temperature station coverage was and how some of the stations are not properly controlled. One station at lake Tahoe had a trash burning barrel next to it for 20 years. Also for nondigital stations the people who record the temperatures frequently record at the wrong time of day to save time. 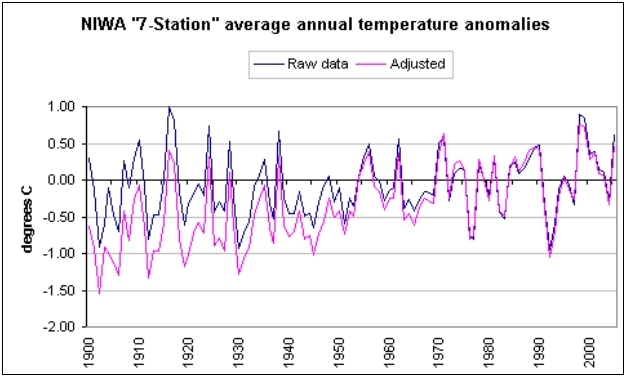 There are stations inaccurate up to 2 degrees which are recalibrated only once every 2 years. Also that some stations represent tens of thousands of square miles which gives the data very poor resolution. Have you read any of the Climategate emails? The emails seems to imply that adjustments to the data intentionally depress historical temp recordings. I’m the Climategate book the author mentions that the north polar ice cap had melted almost completely twice in the 20th century. Once in the 1930s and again in the late 1950s. Its hard to find any records of this online. Do you know anything about this? Because if it’s true retreat of arctic ice is completely normal and nonalarming. The latitude cited (89 deg, 21 min) is still frozen as of now.